My friend Jess lives in Brooklyn with her two adorable kids, and we’ve been online friends for years! She was lamenting that she had all these beautiful fabrics that she’d brought back from a trip to India, but never enough time to do something with them. 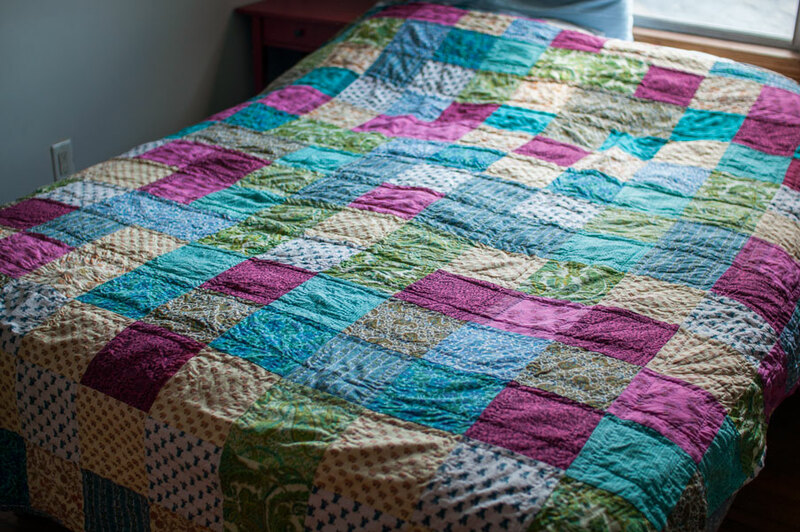 I’ve really been enjoying hand quilting the last few years, so I volunteered to make her fabrics up into a quilt! 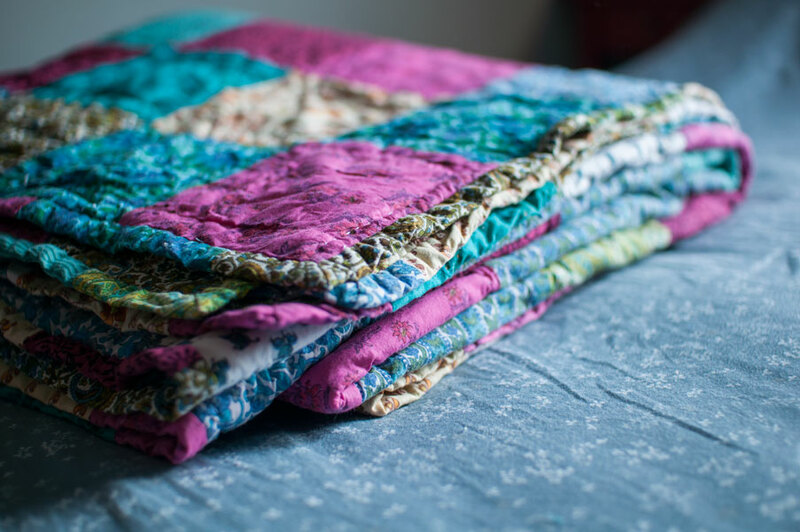 It seemed like a nice opportunity to put a quilt together without having buy all the materials (which can be a lot) and sometimes I like the act of making even more than the finished product. She packed up all the fabrics and batting and mailed them up to me, with the understanding that it might take me awhile to get the quilt done. I was aiming for a year, but it took a little longer – about 17 months. Of course I didn’t work on it intensively, there were times when I would put it down for weeks. 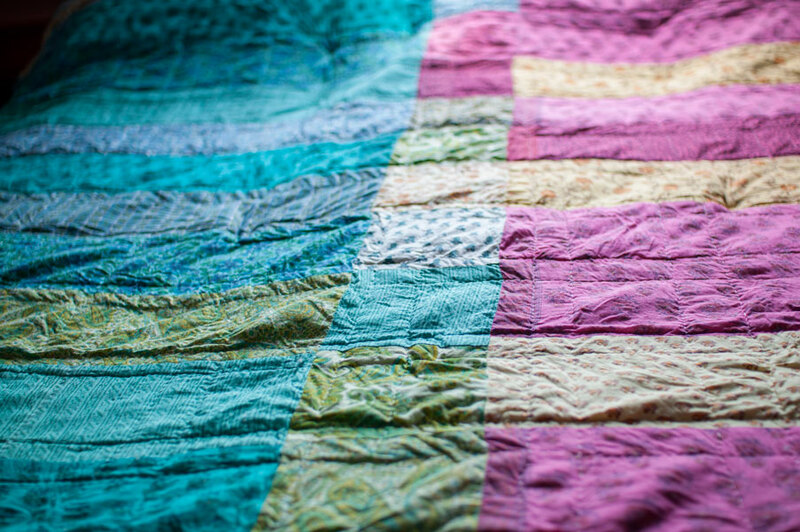 The top went pretty quickly because I did it on the machine – this strip piecing tutorial came in very handy. Each block is about 4.5″ square, finished. I actually make the top a little too big the first time, so I just took a couple of strips off the side and bottom. I used one pieced strip down the middle of the back, and the others to make the striped binding. 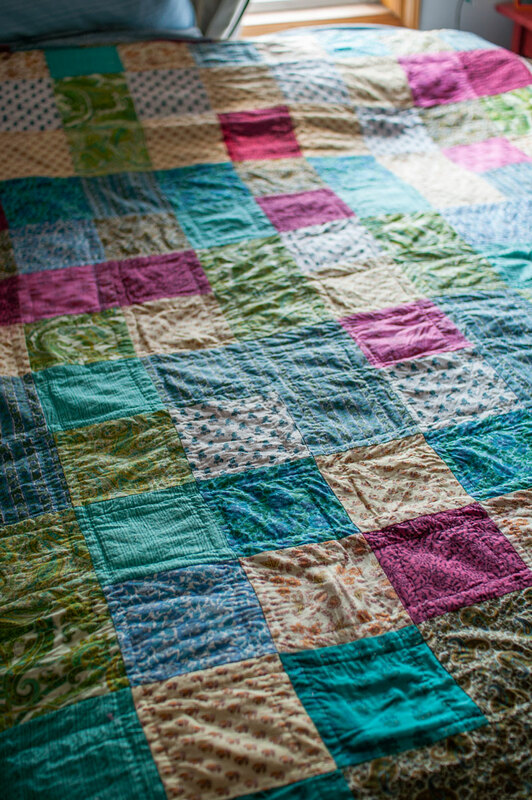 The back is made up of width-of-fabric strips that I didn’t use for the top, with blues/greens on one side of the centre strip and pinks/yellows on the other. 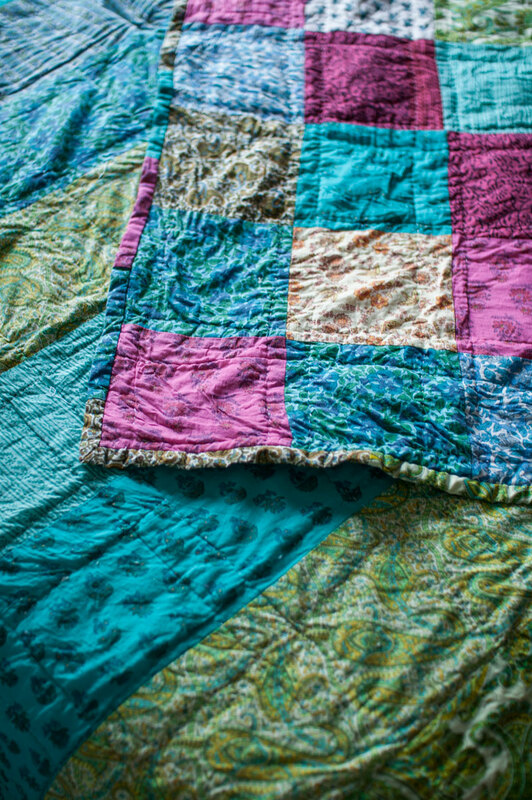 Once everything was pieced, I made my quilt sandwich and thread basted it together really well before I started hand quilting. It’s not perfect, but I know it’ll be cherished for years to come! 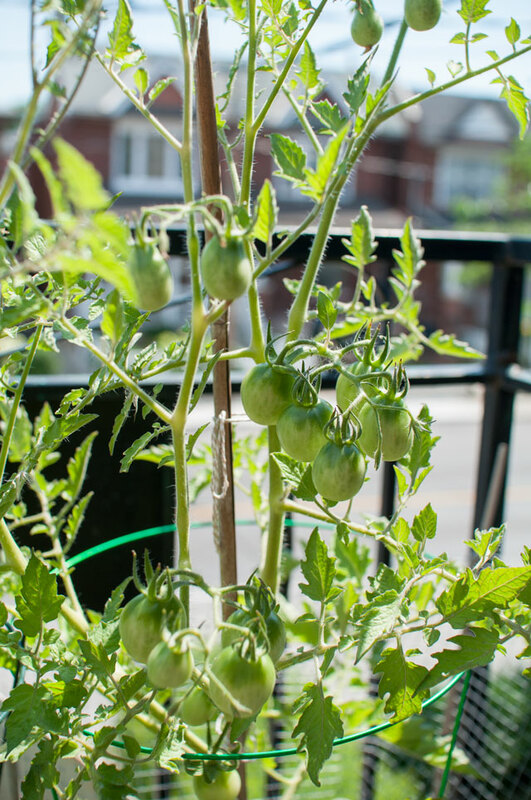 I haven’t been updating much on the garden, but it’s going really well this year! 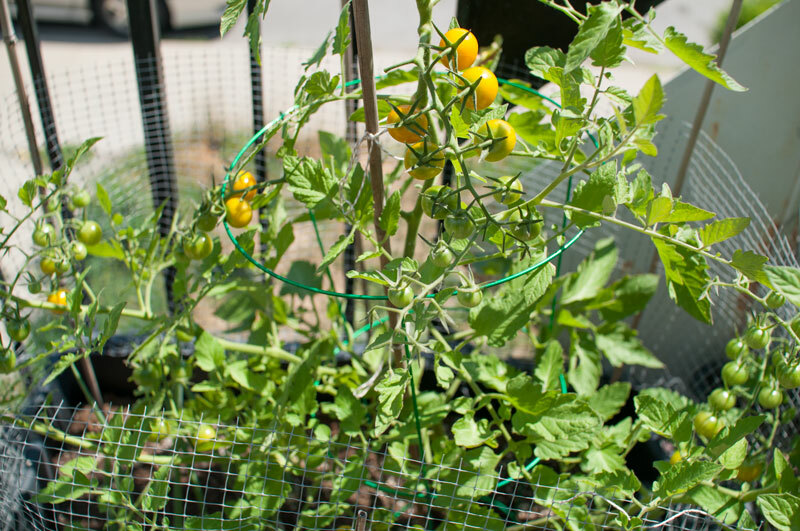 Lots of tomatoes and basil. 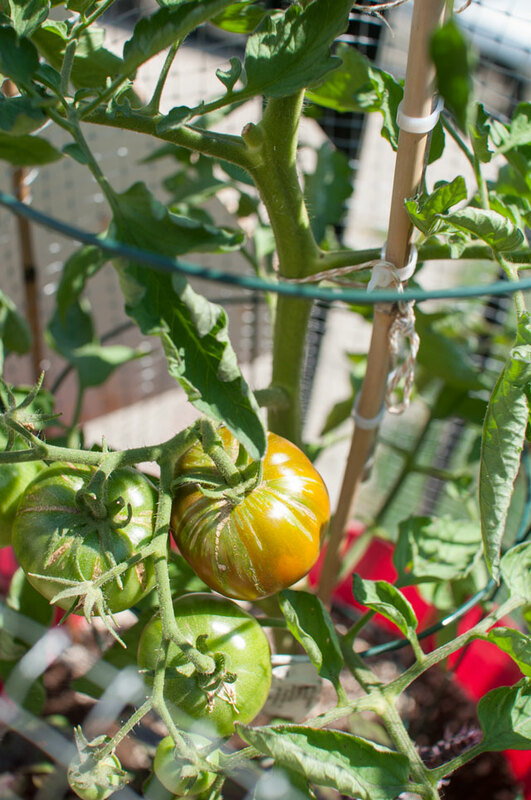 After the squirrel heartbreak of the last couple summers, we didn’t plant any zucchini or cucumbers for them to munch on and it seems to be working! I guess they’re not interested in anything else. 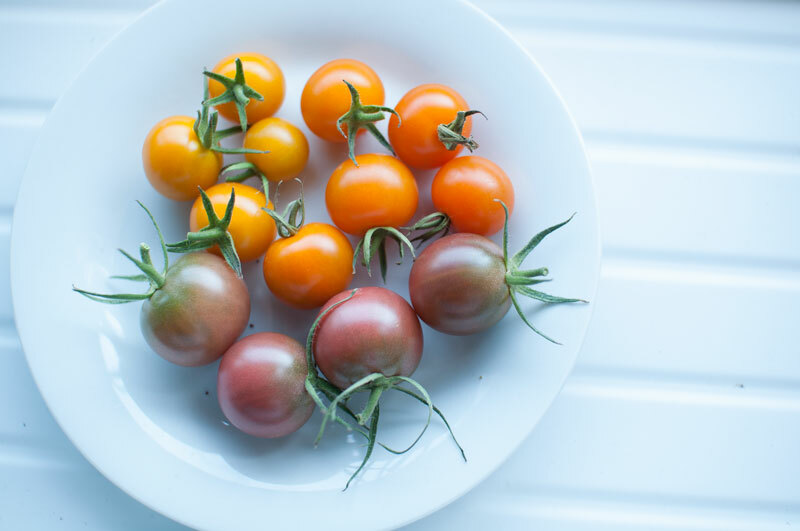 Tomato varieties this year are: Black Prince, Sungold, Ivory Pear, Black Cherry, Matt’s Wild Cherry. The Snooker Mitts KAL is underway on Ravelry! It’s a pretty small group right now so join us anytime! Hashtag for IG and Twitter? #snookermittsKAL! 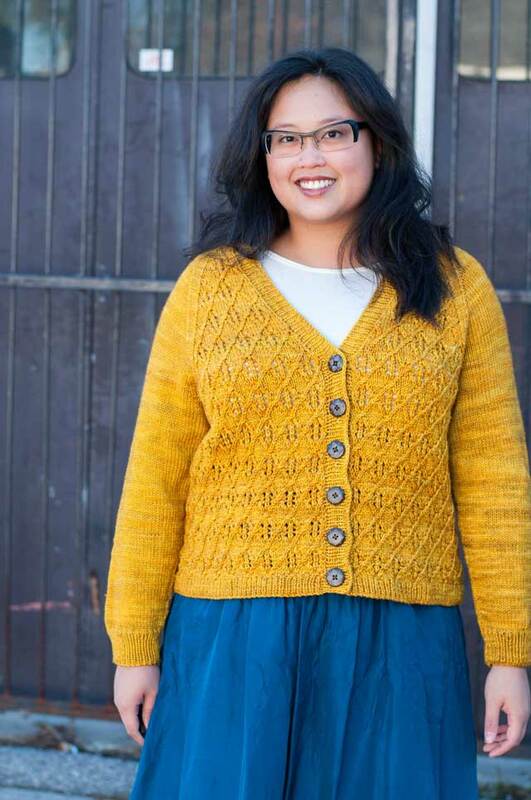 Marled yarn is all the rage right now, and Mountain Colors Twizzle is an awesome example! The silk plied in with the wool take the dye extra brilliantly for that cool effect. Do you have your yarn ready? 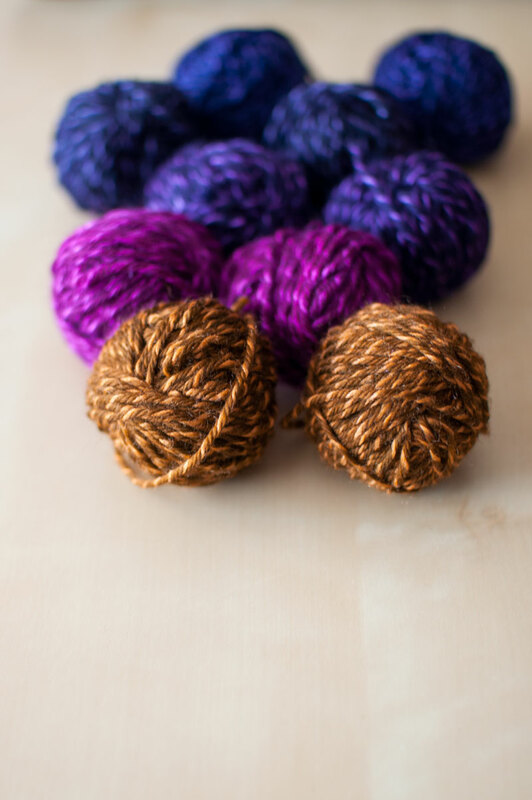 The Perspectives kits come in adorable mini-hanks (twisted skeins), but you’ll need to wind them into balls before you can get started. Since I knew I was making a pair of mitts, I wound each skein into a ball then wound half of it off by weight, to make pairs of each colour. 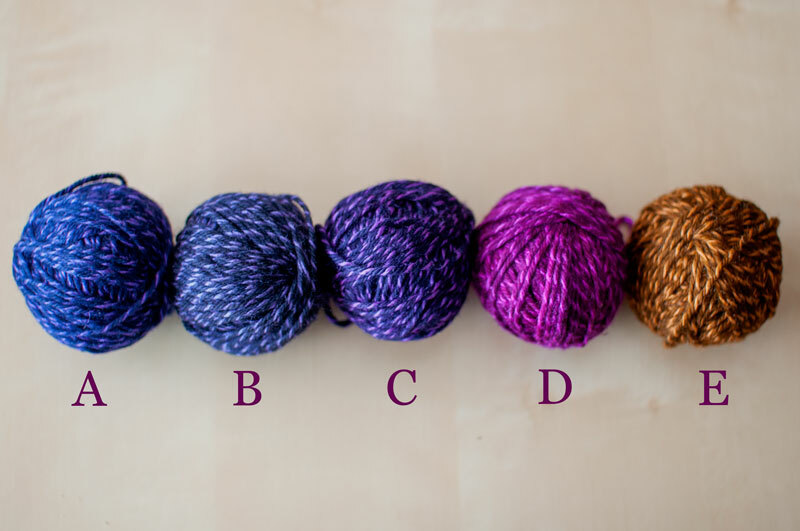 Make sure you know what order you want to use the yarns in – this is mine! I’m planning to do a few tutorial posts throughout the KAL which runs to August 22 – check out the prizes for joining!